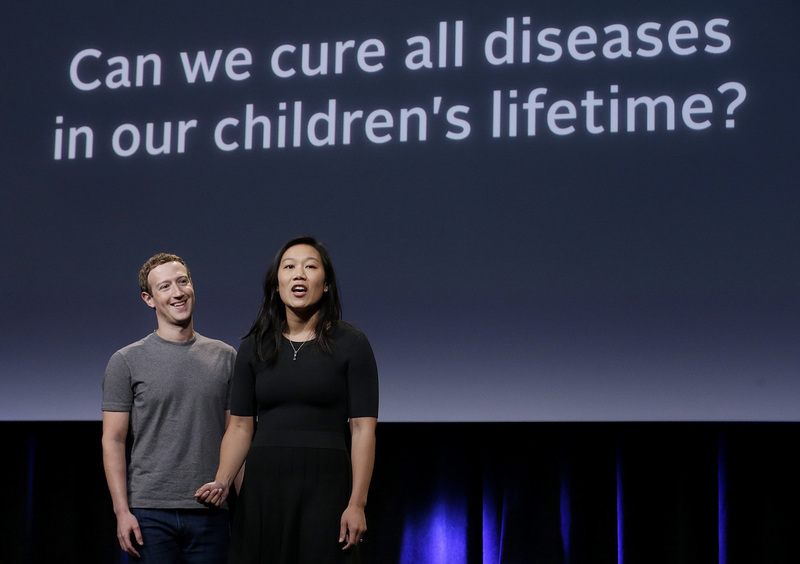 Chan Zuckerberg Initiative Announces $3 Billion Investment To Cure All Disease : The Two-Way Facebook founder Mark Zuckerberg and his wife, Priscilla Chan, promised to give away their $45 billion fortune during their lifetime. This is one of the biggest investments so far. Facebook CEO Mark Zuckerberg and his wife, Priscilla Chan, rehearse for a speech in San Francisco. The Chan Zuckerberg Initiative just announced one of its biggest investments to date: It is ponying up more than $3 billion to kickstart "Chan Zuckerberg Science," an initiative that plans to bring together multidisciplinary teams of scientists in an effort to prevent, cure or manage "all diseases in our children's lifetime." If you remember, at the end of last year, Facebook founder Mark Zuckerberg and his wife, Priscilla Chan, promised to give away almost all of their $45 billion fortune during their lifetime. This project is a part of that promise. Chan and Zuckerberg made the announcement Wednesday during an event in San Francisco that was streamed live on Facebook.
" 'That doesn't mean that no one will ever get sick,' Mark Zuckerberg later said. But the program aims to eventually make all diseases treatable — or at least easily manageable — by the end of the 21st century. 'Our society spends 50x more treating people who are sick than on finding cures. We can do better than that,' said Zuckerberg. "At a distance, the project is reminiscent of Calico, Google's high-profile, secretive, and often-questioned mission to solve death. The Chan Zuckerberg Initiative comparatively offered more detail on the project during its announcement event.
" 'The plan,' as Zuckerberg calls it, is to 'Bring scientists and engineers together, build tools and technology, [and] grow the movement to fund science." In partnership with the University of California, San Francisco; the University of California, Berkeley; and Stanford University, the initiative will create an independent research facility called "Biohub." "Joseph DeRisi, a UCSF biochemist, and Stephen Quake, a Stanford professor of bioengineering, will run the independent research facility which is embarking on its first two research projects: The Cell Atlas, a map of the different types of cells that control the body's major organs, and the Infectious Disease Initiative, which will explore new approaches and develop new tools for creating drugs, diagnostic tests and vaccines that could aid the fight against such threats as HIV, Ebola and Zika. "'Future scientific advances likely will be at the interface of different disciplines — a 'convergence' that requires breaking down barriers between fields. This is exactly what Biohub is planning,' David Baltimore, a Nobel Prize winner and professor at the California Institute of Technology wrote in an editorial published Wednesday. "In his remarks, Zuckerberg laid out his vision for eradicating disease: bring engineers and scientists together to more swiftly build new tools to advance efforts to tackle leading causes of death: heart disease, cancer, infectious diseases and neurological diseases." The $3 billion investment will be spent over the next decade. For some perspective, it's worth noting that the fiscal 2016 budget for the National Institutes of Health is more than $31 billion.